This is part one of a two-part series on branded boxed cereals. Here at Casual Kitchen, we have completely banned sweetened and processed cereals from our pantry. These sugar- and salt-laden quasi-foods are one of the most pernicious rip-offs in the entire food industry. They are wastefully and often deceivingly packaged. On a per-pound basis they cost more than expensive cuts of meat. And worst of all, they often target the consumers among us who are least able to resist: our children. Today's article will expose some of the noxious marketing methods practiced in the cereal industry. In a few days, I'll follow up with a post that suggests some ways to fight back. Let's start by asking a fundamental question: why is cereal so expensive? How do these companies get away with charging so much money for such unhealthy food? Here's how. First, just a few large cereal manufacturers control the distribution channels to your grocery store, limiting competition and giving them pricing power similar to those of spice manufacturers. Second, cereal is a particularly egregious example of a second order food, larded up with an enormous stack of processing costs, advertising costs and packaging costs that get passed to you as the consumer. But perhaps the sneakiest and most anti-consumer trick these companies use is the stealth price hike, where the manufacturer keeps the price of the cereal the same, but reduces the amount of product sold in the box. This technique is used widely throughout the consumer products industry, and it's effective primarily because most consumers simply don't notice. Classy, right? Well, imagine if you were a cereal manufacturer and you used this sneaky technique repeatedly over a period of years. Your one-pound, $4.99 box of cereal would shrink to 15 ounces, then 14.5 ounces, then 13 ounces, then 12 ounces. It's worth noting that a 12 ounce box of cereal priced at $4.99 really costs $6.65 per pound! Do these food manufacturers actually consider this a viable long-term pricing strategy? Something tells me that ten years from now, when we're paying $4.99 for a half-ounce box of cereal, consumers might begin to see through this. Even the way cereal is sold to us is a sham. Walk down your local grocery store's cereal aisle and you'll see row after row of extremely tall, skinny and lightweight boxes. There would be far less packaging waste and it would be far more efficient to transport cereal if it were packed in shorter, cube-shaped boxes, but tall, skinny boxes look like they are bigger. Thus, thanks to the many thousands of hours the cereal cabal has spent test marketing product shapes and sizes, your cereal comes to you inefficiently packaged--and costs, waste and efficiency be damned. Just look at that picture for a few seconds and tell me it doesn't make both your eyes and your teeth hurt. And by the end of my third bowl [of Chocolate Frosted Sugar Bombs], I usually feel sick. I suppose the most pernicious aspect of the cereal industry is this: there are well-researched reasons why these products are branded and packaged the way they are, with bright colors and cartoon characters. Everything is designed to grab the eyes of your children. The implicit presumption is that the child, not the parent, makes the buying decision in the grocery store. Moreover, your kids also serve as an indirect reason why these cereals are saturated in sugar and sodium. Children tend to prefer simple tastes like sweet and salty (admittedly, many adults do too), so they gravitate towards cereals that contain extra high-fructose corn syrup and salt. As consumers, we need to use our collective economic clout and show the companies who make these quasi-foods that we will no longer tolerate cereals that are unhealthy, overpriced and questionably marketed. We want something better. In a few days I'll go over some ideas on how to fight back. Readers, tune in tomorrow for the next column in this series: How to Fight Back Against Overpriced Cereal! I don't eat boxed cereal but my husband does, and I wish we could find something that is better for him (and our budget) and as convenient. I'll definitely be tuned in for tomorrow's article! I can't wait for tomorrow's article, either! It'll be great to see some more alternatives. I am a big fan of oatmeal (I make it in the rice cooker while I'm taking my morning shower) or homemade granola (which I make in big batches). Both are cheaper than sugary cereal, and better for you, too. Excellent and important post. You couldn't pay me to eat boxed cereal. I personally believe cereal makes people fat. It's so profoundly unsatisfying that people often eat multiple servings or eat again an hour later. And the prices are indeed ridiculous. My current favorite breakfast? Bulgar with buttermilk, maple syrup, and toasted nuts. Don't forget the marketing technique of putting the cereals aimed at children on the lower shelves -- right at their eye level. Some realy insightful comments. Thanks everyone for the input. I have to say, I'm also really curious how cooking oatmeal in a rice cooker would work. And I don't even like oatmeal. Oatmeal in the rice cooker is laughably easy. I use the regular Quaker Oats (neither the instant nor the steel cut slow cooking ones). Ok, here's a blog post by me about it! I love this kind of treatise and all the detail! Thanks Daniel - this was fun to read. A few months ago I switched from a daily breakfast of grapenuts, kefir and berries to one of homemade granola, kefir and berries, and just yesterday pulled out the old West Bend 1-quart yogurt maker (no longer available in stores, but I see them at tag sales) and made a very nice batch of yogurt with which I'm replacing the kefir, since I can make 4 quarts of yogurt for the price of one quart of kefir (I tried making kefir once but it didn't work - probably just need to keep trying). I also stir about a tablespoon of flaxseed meal in with all the other stuff. Health note: I had my cholesterol tested last year. I kept putting it off because I thought I should start taking fish oil or I would get into trouble, because I use butter and even put heavy cream in my coffee. Then I thought, might as well know the worst, & went ahead and had it tested. My doctor told me she had never seen such an awesome HDL level. I'm quite sure the flaxseed helps. Great post! We were eating mostly homemade bread from the bread machine for the longest time. Then we had a kid, and Cheerios came back into our lives. I mostly eat oatmeal (steel-cut), toast, bread, or english muffins (whole grain from the day-old rack). My husband usually has an english muffin AND cheerios. Well, he added Cheerios to my list, and they were $4 or $5! I just tend to buy them on sale, or in this case...go to Trader Joe's, and buy them for $2. However, this is a good reminder that I need to make some more granola, and maybe some yogurt too. I completely agree about boxed cereal. Overpriced and under nourished. We make whole grain brown rice in the slow cooker. My favorite is sweet brown rice, but any short grain brown rice will do. Use lots of water, dried fruit in the winter, and lots of cinnamon. Start it when you go to bed at night. And wake up to fragrant, instant breakfast. Serve with nuts and ground flax seeds. Great post!! 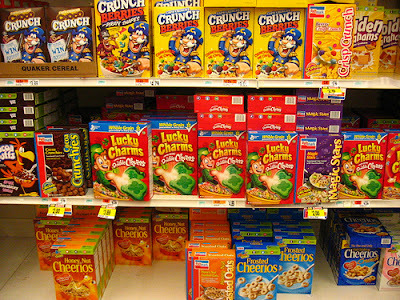 Its appalling how expensive and unhealthy almost all packaged cereals are-even ones that claim to be "health food"! I'm all about oatmeal or quinoa porridge for breakfast! You can make steel-cut oats in your rice cooker too. I just started doing it last week. My cooker makes two servings' worth so it takes 2 C water and 1/2 C steel cut oats. I set the timer to an hour. When it dings I add my little bit of brown sugar (it's still fairly soupy at this point), and divide in two bowls. One goes in the fridge for the next day (reheat about a minute in the microwave) and I eat the other one. You can definitely do it the night before too. Just be aware that oats do thicken up and you won't be able to stir things in easily unless you do it as soon as they are done in the rice cooker. Most of the world doesn't eat cereal for breakfast - and if they do it's not this crazy expensive boxed stuff. Coming to this years late, I doubt anybody will read it now haha. But I still felt like chiming in with my two cents! My family buys boxed cereal, though we hadn't realized what a ripoff it was. But right now we have two kinds in our pantry, one brand in a standard tall thin cereal box, and one box that's shorter and cube shaped. The taller thinner boxes are actually way better, because the short cube box is really hard to pour from!